We create a menu that is just right for you, prepare it onsite, and serve it “hot from grill to plate” for the best in taste and flavor. Our specialty is catering picnics for large corporate events. It takes a lot of experience and organization to cater a great-tasting menu for a large company picnic. Our experience has given us the ability to know how to do it right when it comes to catering events. 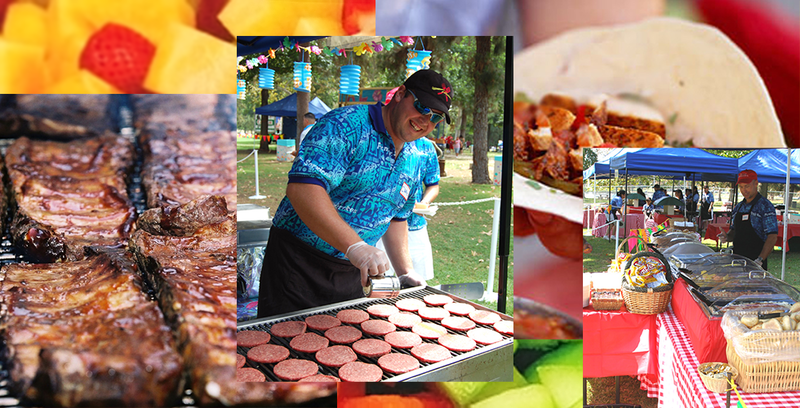 If you’re planning to have your company picnic in Los Angeles, Orange County or Riverside, let us work up an awesome menu for your event. Our fleet includes refrigerated trailers to assure that even on the hottest summer day food is chilled to the right temperature. Service is fast and efficient because we provide more than enough equipment and staff at our corporate events. Only fresh, in-season ingredients are used in our catering menus. Vegetarian entrees are part of every meal. Presentation includes colorful canopies, linens and themed decor. Standard service time is 3 hours, but hours can be adjusted to fit your needs. Friendly servers and popular snacks make for happy, satisfied customers. We offer the most popular concession snacks and drinks for our picnic customers. Our catering team creates custom snacks to fit picnic themes and special requests. Just the right mix of concessions at a corporate event will keep your guests satisfied throughout the day. We serve unlimited amounts of Coke, Diet Coke, Sprite, Lemonade, Iced Tea and Ice Water. Bottled water and other beverage amenities are available upon request. Options consist of domestic and imported beers and a wide selection of wines. Professional bartenders and liability insurance are included in our services.